I had a problem with with iOS 11 Beta 3. I couldn’t open an ePub file from Apple’s new Files app on the iPad – it would just invoke iBooks and leave me at the bookshelf with the ePub nowhere in sight. I opened up bug 33410770 and waited. My bug was closed and marked as a duplicate of 33148498. Just before beta 5, the main bug was closed. I installed beta 5 and still could not view my ePub in iBooks. Harrumph! When you’ve been duplicated to another bug, you have no insight into why it was closed or in what build the issues is fixed in. Maybe it will be fixed in beta 6? Nope. Maybe it will be fixed in beta 7? Nope. OK, something really weird is going on. This seems like a basic function to me. What am I missing? Turns out, “Hide iCloud Books” was enabled in iBooks. After turning that off: Voila – there is my ePub with the “Available for download” icon. How did my ePub get there? Had it been there all along? Why does it have the “Available for download” icon? I just clicked on the ePub from the Files app – shouldn’t iBooks have imported the ePub from there? Does iBooks consider the ePub inbound from the Files app the same as the one coming from the cloud? If it wasn’t an ePub that was also in the could, what would the behavior have been? What is the correct behavior? A friend’s Apple ID was compromised and used to purchase an iTunes Gift Card with someone else’s credit card. Here’s how it happened: in March, her Apple ID was accessed by an attacker and her name, address, phone number, and credit card were changed. Twenty-four hours later the attacker purchased a $20 iTunes gift card. Four days later, Apple failed to charge her Apple Music subscription to the stolen credit card – the credit card had been canceled. This all came to light four months later when I was called in to troubleshoot why she couldn’t make purchases in iTunes. We have since changed her iTunes password and turned on two-factor authentication. We also verified the devices logged in to her Apple ID account were known good devices. Apple made a big splash when they announced that WWDC would be in San Jose, CA in 2017 for the first time since 2002. I just finished a 6-year gig in San Pedro Square which is 4 city blocks from the McEnery Convention Center. What follows are a my thoughts on downtown San Jose. This list of places to eat isn’t exhaustive. These are some of my go-to’s. YMMV. I’ve also included some sights. San Jose has seen a boom in housing recently. Two new apartment towers have opened in the last few years with more on the way. This is helping the restaurant/bar scene have more customers after dark. San Jose may never shake its reputation of being a sleepy town but that doesn’t mean you’re not going to have a fantastic time. Original Joe’s. You’ve just stepped into a 1950’s eatery and expect Frank Sinatra to start singing at any moment. Must have starter: sautéed spinach with bacon. Pizza My Heart. Local chain that has thin crust pizza by the slice, salad and drink down cold. Specialty’s Cafe and Bakery. Open during business hours only. A chain but I always find good stuff here. Scott’s Seafood, Morton’s Steakhouse and McCormick and Schmick’s are also some anchors in the area. Lots of people like Il Fornaio. However I’m not a fan. Psycho Donuts if that’s your thing. La Victoria Taqueria Often a go-to for late night eats and they have a surprising number locations around downtown. This location open until 3am! Venues: City National Civic (Cap. 2,850); The Frank Lloyd Wright designed Center for the Performing Arts (Cap. 2,677); the California Theater (Cap. 1,119) is where Apple announced the 4th Gen iPad and iPad mini in 2012; and the Tech Museum of Innovation with IMAX domed theater. I expect things to happen here. This starts to be where I have the most experience. San Pedro Sq Market – just a few years old (but restored from the turn of the last century) and a true gem. Think food court with indoor and outdoor seating. All local businesses. Something for everyone. Includes a barber shop! Great coffee at B2. I highly expect events to take place here. Firehouse No 1 is my old stomping ground with great food and just a bar after 10pm. SP2 is another great spot just outside the Market. Olla Cocina and the Farmers Union are notable too. We also have a gamers lounge called AFK. A local pub to try out is O’Flaherty’s and Five Points. Togo’s has a long history in the Valley. Check them out if you want to know what it was like in the 70’s to have lunch in the Valley. They used to be everywhere and often served alcohol for those 2-hour lunches. La Victoria Taqueria Various locations downtown. This location is open until midnight; 3am Thur, Fri, & Sat. Freshly Baked – Hole-in-the-wall, only open for lunch but worth the walk. Cash only. Maybe consider splitting sandwiches with a friend. There is some speculation the keynote will be at SAP Center at San Jose (capacity 19,000). Just a block from there is our newest Whole Foods Market which has an onsite brewery and outdoor seating area. A littler further down is Chipotle, Five Guys and two local hot spots: the small and intimate Zona Rosa and Tee Nee Thai. Falafel Drive In. This hole-in-the-wall is worth the drive. The special is a falafel and banana shake. My go-to is the gyro salad, humus and banana shake. Lincoln Ave in Willow Glenn, an upscale neighborhood in San Jose is a tree lined street with great places to check out. Bill’s Cafe for breakfast (a local institution) and Crepevine too but they are also open much later. The Table in San Jose recently expanded and has a must-see neon sign. Aqui Cal-Mex is always popular – in part because of their slushy machine serves alcohol. Powell’s Sweet Shoppe for all your candy needs. Willow Glen Creamery for ice cream (all kinds); including Dole Whip if you need a Disneyland fix. There is another Pizza My Heart here too. I’ve really just scratched the surface of what’s here. Oh, and check out the “must see” Hicklebee’s books store – be sure to find the “author signature” covered walls in the back. There are two big malls near by. Valley Fair contains the Apple Store and has a large food court. It’s your typical upscale Westfield shopping mall (fun fact. It’s half in San Jose and half in Santa Clara). It’s currently undergoing an expansion so a bit of a mess. Bazille restaurant inside Nordstrom is a hidden gem. There is a Cheese Cake Factory if that’s your thing. Having to work in the dark ages is never fun. My new .exe in Microsoft eMbedded Visual C++ 4.00.1610.0 was providing that experience when I couldn’t get to the Version tab when I invoked the file properties of my .exe in Windows Explorer. The Version tab just wasn’t there. Looking at working projects provided no clue. Turns out in my very thin .exe, when the resources were being compiled, it wasn’t picking up the define for VS_VERSION_INFO. Instead of complaining it happy converted it to a string: “VS_VERSION_INFO”. To get this to work I had to add “#include <windows.h>” to the resource.h file. After a full recompile the Version tab now shows up. I had a frustrating experience with iPhoto 9.2.1 under Mac OS X 10.6.8. iPhoto got into a state where it would beach ball shortly after launching regardless of the state of the OS (fresh boot, fresh image, etc.). Turns out the problem involved movies from a Canon SD870 IS camera. Here’s what to do if this problem befalls you. In the Finder, move the photos off the memory stick and into the movies directory. Delete the *.thm files. In your ~\Library directory search for iPhoto in the “Library” directory (not “This Mac”) in the “Filename” (not the “Contents”). Delete iPhoto from the caches directory and the 1 or 2 plist files in the Preferences directory. Reboot. The reboot is important. Something remains in memory otherwise, it’s not clear what. You can tell the difference by what happens when you launch iPhoto after step 3. If you don’t see iPhoto first-run activity (welcome to iPhoto) then you know something didn’t get removed. I consistently saw first-run activity after a reboot. My two year old MacBook Pro’s hard drive failed and I took it in to the Apple Store to get it fixed. I’m now running off a backup of my MacBook Pro on the family’s new MacBook Air. All is working as you would expect. But applications purchased from the App Store do not work. When I attempt to launch an App Store purchase, I am presented with the dialog, “Sign in to use this application on this computer”. Nothing further happens after entering my credentials. Now, every time I click on an App Store purchased app on the dock I get a single bounce and then nothing. I spoke with Apple support and was escalated one level to no avail. It would seem this is an unsupported configuration although I tend to doubt it’s a driver issue support was hinting at. I stopped them when they wanted to migrate the image to the MacBook Air. This is temporary situation until my production computer is fixed and that exceeds the amount of work I wanted to put into resolving this issue. Interestingly, App Store purchases downloaded to the MacBook Air’s drive work when launched while booted from my external MacBook Pro drive. Presumably Apple is tattooing the applications with an identifier (Serial Number? Hardware UUID?) from the physical computer that allows me to run the “MacBook Air installed Apps” on my booted MacBook Pro image running the MacBook Air. In the end, not sure if this is a feature or a bug. Support clearly doesn’t understand the mechanics involved. I suspect only an App Store engineer does. Minutia: Mac OS X Lion 10.7.2 (11C74). When this MacBook Air is booted normally it is attached to the same Apple ID and purchases work. In Remote Desktop Connection Client for Mac connect to a PC (I tried Win7 and Win Server 2003 R2). In RDC’s OS, open Notepad.exe and type a phrase; select your phrase; and copy it. Switch to VMware Fusion and paste your phrase. This will not work. Go to Apple Mail on the Mac and paste your phrase in a new email. This works. Workaround: After pasting the phrase into Apple Mail, select the phrase and copy it again. You can now paste it successfully into VMware Fusion. On my iPhone 4 (iOS 5.0 (9A334)), after interrupting a podcast I was listening to at 2x speed to take a call, the podcast speed changes to 1x when the call ends. Normally, the podcast resumes at 2x speed. As a work around, I pause the podcast with my wired handset, then press play and it resumes at 2x speed. If you’re having the same issue, report it as a duplicate of Bug ID# 10399008. Dennis’s dad, Joe, worked at Homestead High School in Cupertino, California in the 1960’s. 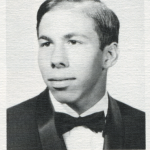 Steve Wozniak attended Homestead in the 60’s too and graduated from there in 1968. Joe has the yearbook from 1968 and I found a couple of pages with Steve Wozniak on them. The first one is his senior photo. 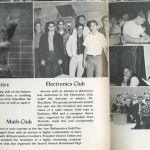 In the second scan, Steve appears in both the Math Club and Electronics Club photos. The text mentions he’s the Electronics Club president. 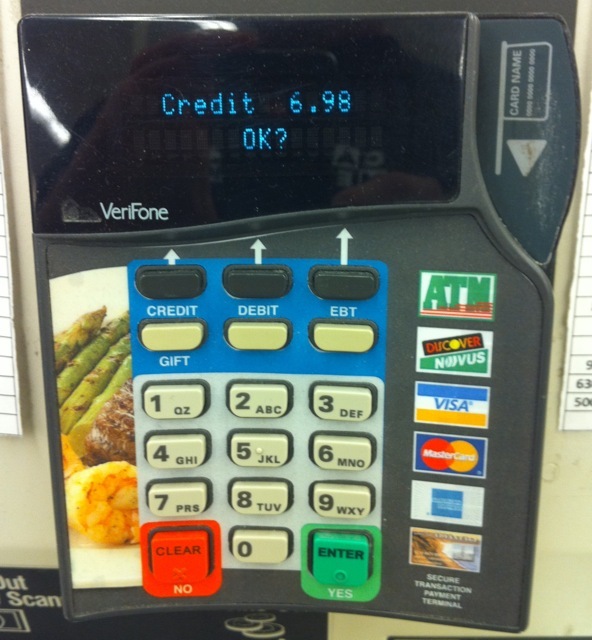 The Debit button’s arrow it pointing toward the “OK?” on the screen. I’ll press the Debit button. Fail. Are they asking me, “Debit or Credit?”. I press the Credit button. Fail. I press the green Enter button. Success! Why is “OK?” the approval phrase? The button they want me to press is labeled Enter AND Yes. Why didn’t they use either of those words? In addition to allowing the Enter button to be a valid input, is there any reason not to have Debit and/or Credit be a valid button too?